6. 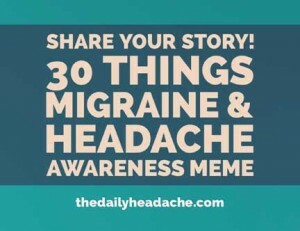 My first migraine attack was: in high school. I couldn’t stand or see and had the worst pain ever in my life. I thought I was dying. The nurse had me lie down for 30 minutes and then tried to send me back to class. Thank goodness, my aunt was a secretary at the school and took me home. 8. My strangest migraine symptoms are: having to urinate every 10-15 minutes! It’s such a pain because just standing and getting to the bathroom is exhausting then I finally get back to bed and I have to get up and do it all over again! 10. I know a migraine attack is coming on when: I can’t stop yawning and I am very weak. 11. The most frustrating part about having a migraine attack is: the effects on my job and my family. 12. During a migraine attack, I worry most about: taking care of my kids. Even though they are (sort of) able to take care of themselves for a while at 10 and 14, I know I am not doing enough for them. 14. When I tell someone I have migraine, the response is usually: how their relative/co-worker/neighbor has them too and what they do to fix it and be able to go about their lives. 17. My best coping tools are: Diet Coke, water, Snickers candy bars, caffeine, dark room, rest, ice, my meds, heavy blankets, blackout curtains, my “Badger – Headache Soother Balm Stick,” silence! 18. I find comfort in: knowing my friends believe me and my girls understand what is happening and know how to take care of me. 19. I get angry when people say: “Oh, I have the WORST migraine!” while they are walking around the office, talking, working, and generally living life normally. It makes me feel like I’m not tough enough to handle mine and/or people don’t believe me when I can’t function when I get one. 21. Something kind someone can do for me during a migraine attack is: My daughters know to bring me ice packs, a water bottle, chapstick, and one of their stuffed animals! 23. The hardest thing to accept about having migraine is: my daughters will probably get them too. 24. Migraine has taught me: Cherish the healthy times. 26. If I could go back to the early days of my diagnosis, I would tell myself: go on a gluten-free diet! 27. The people who support me most are: my girls and my friends. 28. The thing I most wish people understood about migraine is: it really is as bad as we say it is. 29. Migraine and Headache Awareness Month is important to me because: I can talk about it and not seem like I’m complaining. 30. One more thing I’d like to say about life with migraine is: every person is different but please believe me when I tell you I can’t stand up to walk to the bathroom, let alone go teach preschool special education.